Writing with a pen is hard! At least, the makers of Bic pens seem to think it is for women. That may be why they recently launched a line of pink and purple pens targeted at women. But while the pen maker may have hoped to capture a new “niche” writing instrument market, the pens are earning them nothing but ridicule on the Internet. 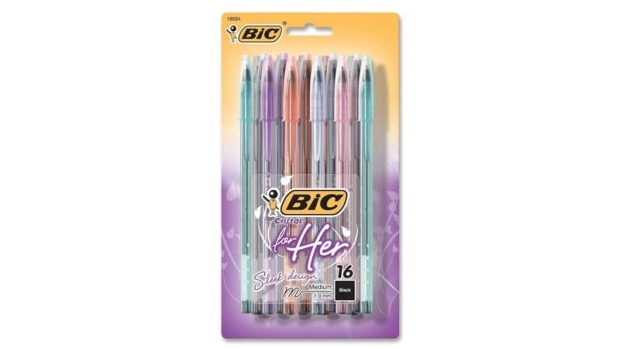 Bic says it designed its Bic Cristal for Her pens with a “sleek pen silhouette and jeweled accents [to] add style” and claims that the pens are “designed to fit comfortably in a woman’s hand.” It’s unclear why Bic thinks that women need smaller, lighter pens. Though pastel-coloured pens aren’t new, and these particular pens have been widely available for over a year, the vitriol over the sexist marketing has reached a fever pitch in recent weeks, with a barrage of hundreds of sarcastic reviews cropping up on Amazon.com. “AT LAST!” writes Amazon reviewer ‘Breemeup,’ “Bic, the great liberator, has released a womanly pen that my gentle baby hands can use without fear of unlady-like callouses and bruises. Thank you, Bic!" It seems that all the ergonomic redesigning and bejeweling that went into the Bic for Her pens isn’t cheap either. Pen for pen, Bic for Her Pens cost up to 70 per cent more than the same, non-gendered pens, reports Business Insider. As for what the pen maker thinks about the all the sudden fun, a Bic spokeswoman tells The Telegraph newspaper in the U.K. that it’s enjoying the reviews. "Bic Pens ‘for Her’ are a style-led product and have proved to be very popular since their launch at the end of last year,” the spokeswoman told the paper. "It is great to see people having fun with the product and we’re delighted to have brought a bit of much needed glamour to stationery cupboards everywhere."